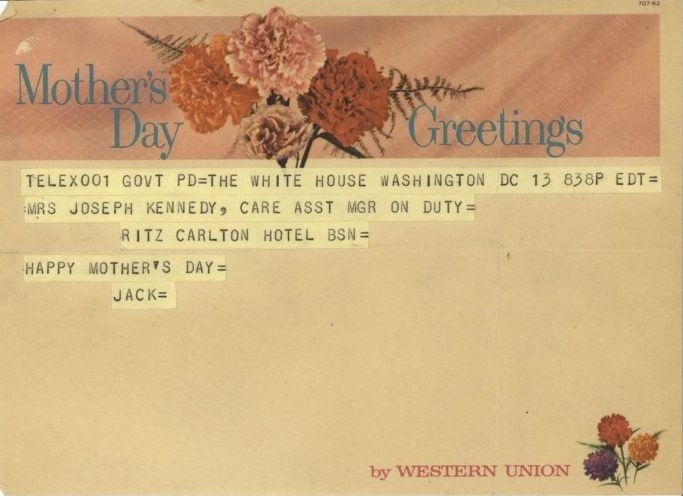 Just in time for Mother’s Day, our digital archivists have published a folder that contains some favorite documents here at the Kennedy Library. This folder comes from the Rose Fitzgerald Kennedy Personal Papers, and the documents inside offer an illuminating glimpse at the intersection of Kennedy family life and the world of high-stakes international politics. In 1962, President Kennedy’s mother, Rose Fitzgerald Kennedy, was already in the midst of a project collecting signatures from notable people to give as gifts. She eventually collected autographs from renowned creative artists like Robert Frost and Marc Chagall; U.S. Presidents Herbert Hoover, Harry Truman, and Dwight D. Eisenhower; and foreign leaders including David Ben-Gurion of Israel and Konrad Adenauer of West Germany, among others. 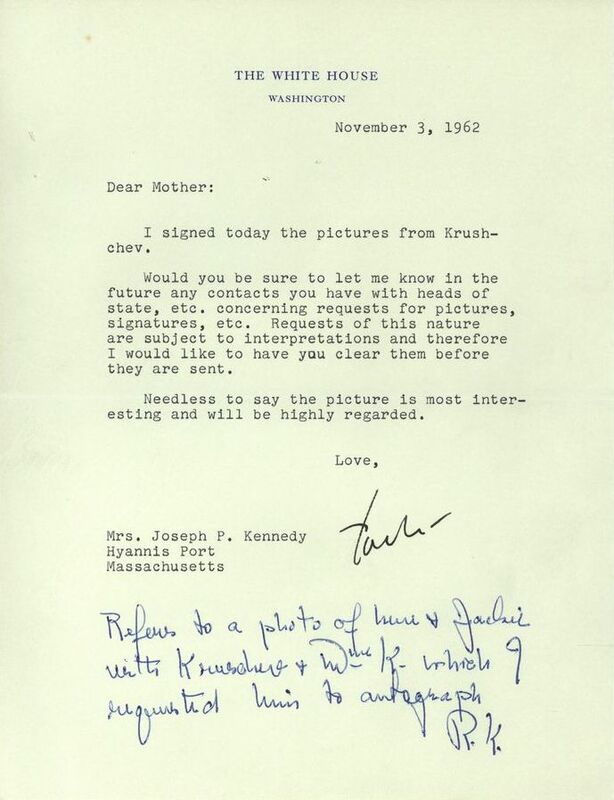 But when Rose Kennedy contacted Soviet Premier Nikita Khrushchev in August 1962 to ask for signed photographs, she prompted President Kennedy to write one of the most interesting personal letters of his Presidency. Having received the signed photographs she requested from Premier Khrushchev, Rose sent them along to the President in late October 1962 and suggested that he add his own signature. 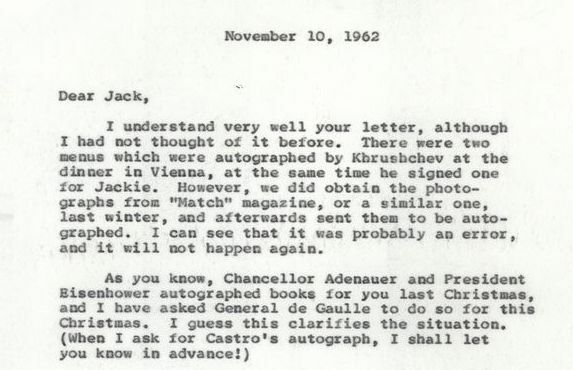 President Kennedy, hearing about his mother’s correspondence with Khrushchev for the first time, responded with this letter – an explanation that asking favors of foreign leaders could be a tricky business. Rose recalled the Khrushchev signature episode when writing her 1974 memoir Times to Remember, noting, “We often joked about the incident later.” It is clear, though, that the President’s mother took her son’s request seriously; a few months later, she asked the President for permission to contact Indian Prime Minister Jawaharlal Nehru for his autograph. According to a secretary, President Kennedy responded “Yes – go ahead,” and Rose’s collection was soon expanded by signed copies of Nehru’s autobiography. 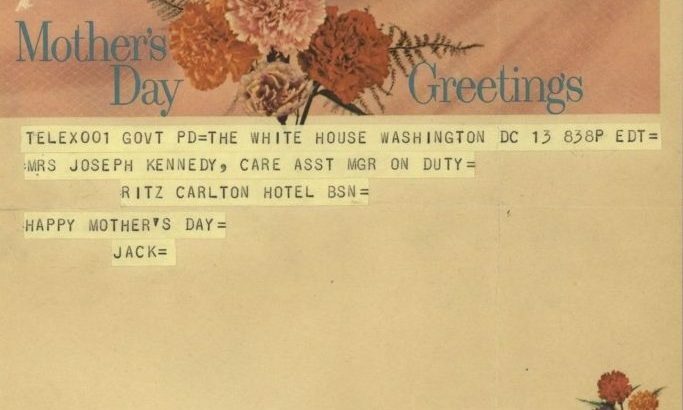 While we already knew that President Kennedy made time for his mother while he was in the White House (see his Mother’s Day telegram below), these letters and the story behind them serve as a reminder of the influence a mother can have, even in the unexpected arena of global politics. You can see all of these letters in this newly-added folder in the digital archives, here. Robert F. Kennedy Attorney General Papers, Box 217, Folder: 6-4-2: Cuba: Cuban Crisis, 1962: Kennedy-Khrushchev Letters, Etc.